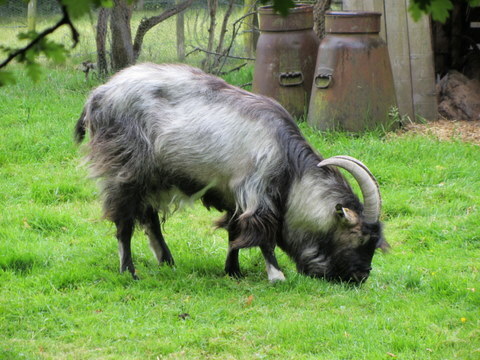 If you’ve ever been around goats at a petting zoo or a maybe on a farm, chances are you have not been around a buck goat at those places. Just to clarify terminology, male goats with their testicles intact are called bucks (or “bucklings” when less than full grown) and goats with their breeding tackle removed are known as “wethers.” Packgoats are usually wethers, partially to keep their rowdy attitudes in check, but mostly because buck goats have an odor that causes most people to wrinkle up their faces and gasp, “Oh F**K! What the f**k is that smell? ?” To say that bucks stink is sort of like saying Arizona summers are warm. Buck stench is both overpowering and offensive, being a mixture of musky, oily, nasty scent glands combined with the fact that bucks urinate on themselves in an effort to “up their game” with the ladies. Of course, this is the absolute worst during the breeding season, yet still intolerable the rest of the year. There really are no words that can accurately convey the magnitude of eau de goat stench. Ever been stuck sitting next to someone who never showers? They reek like a mixture of vinegarized piss and armpit funk. 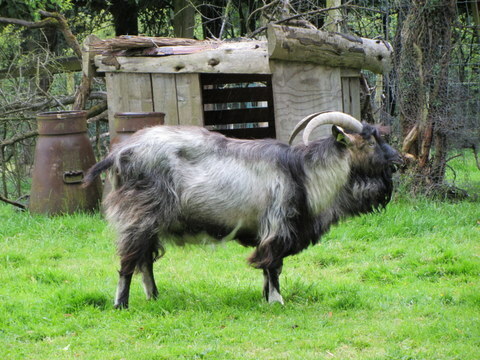 That sort of offensive nastiness has nothing on buck goats. Buck goats take “rank” to a whole new dimension. The best part is, once you get close enough smell a buck goat, you will walk away smelling just like him. The scent is trapped in tiny airborne oil particles that stick to everything. So when you walk away cussing about how you can’t the smell out of your nose, that’s because it’s all over your clothes. That’s awesome. Like when you run out to the barn to grab something, and then jump in the car to go meet your wife for dinner. Then your clothes and your car get to smell like goat too. Makes for a nice dinner. Good luck trying to find a bottle of wine that goes well with goat stink. I work with a guy who bought a buck goat for his wife. She has dairy goats and wanted a buck for breeding. I told him, “you better build that buck barn as far away from your house as possible.” He laughed and thought I was exaggerating. The day after he brought their new buck home, he came to work, still raving about the stench. “I put that thing in my truck and now I can’t get the stench out of the canopy. I can’t even drive the truck it’s so nasty.” BAHAHAHAHAHAHA! Seriously, I’d rather deal with skunk smell. My string of packgoats is made up entirely of wethers. No bucks and no plans to ever get any bucks. I’ll leave you with this thought: some people don’t mind the smell of buck goats. I have no idea how that is possible. I would think even people who never shower would find buck goat smell offensive. If you’re one of those people, remind me never to invite you over for dinner. This entry was posted in Hunting, Packgoats and tagged buck goat, buck odor, goat smell. Bookmark the permalink. Well, now I get why you’ve been peeing on yourself. Just trying to up your game with me. Hehe! Just adopted a buck from local animal shelter. He was castrated two weeks ago. Is there a possibility that the odor will go away or at least diminish? He is an adult. Yes, the smell will definitely diminish over time. If you brush him and then give him a bath, that will speed things up. After about a month, you won’t notice any buck smell at all.